The popularity and application of slatwall panels has grown significantly over the past decade. From use in retail stores to office partitions, the application of slatwall panels is endless. StoreWALL offers 2 types of slatwall panels, its Standard Duty and the Heavy Duty Panel. Today’s article is a review of the Heavy Duty Slatwall Panel. StoreWALL’s Heavy Duty Panels are built incredibly strong, rugged and waterproof. They are ideal for the most demanding applications. Installation is also easy on any surface including wooden studs, plaster board, direct concrete as well as metal studs. The Slatwalls install using the StoreWALL InstallStrip hidden fastener system for fast and easy installation. 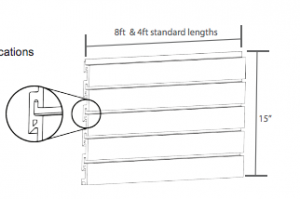 Each Heavy Duty Slatwall Panel comes in the following dimensions: 2438.4mm x 381mm x 17.7mm and weighs 7.43KG. Colour range on offer includes Brite White, Graphite Steel, Global Pine, Rustic Cedar and Weathered Grey. 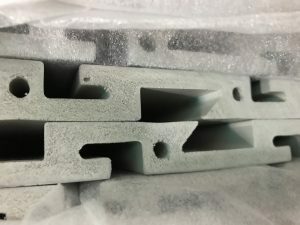 StoreWALL panels are manufactured with Heavy Duty Thermoplastic. This ensures they are highly durability and the colour and quality are consistent throughout the panel. Manufactured with a solid core ensures panels are 100% waterproof, mould, mildew, and stain resistant. They are also easy to clean and can be used for both indoor or outside applications. Each panel is also 100% Class 3 Recyclable. In Australia we are only stocking the Weathered Grey colour. The other colours including Brite White, Graphite Steel, Global Pine, Rustic Cedar are available as a special order. Minimum order quantities will apply, please call us to discuss. We recommend the use of InstallStrips for installation. Custom InstallsStrips have been developed for the Heavy Duty range. Heady Duty InstallStrips are not interchangeable with the Standard Duty InstallStrips. Featured below is a short video comparing the Heavy Duty panels (profile/thickness) with that of the Standard Duty Panel. You can see that the additional 1mm in thickness makes a difference. Each panel is also taller when compared to the Standard Duty Panel. The dimensions for the Standard Duty Panel are: 2438.4mm x 304.8mm x 16.7mm. The height difference in the panel is 381mm (HD) Vs 304.8mm (SD). Standard Duty slatwall panels are ideal for domestic use. Use them in your laundry or inside a pantry. Similarly if its a home garage and you want to either panel all or part of the exposed wall, the Standard Duty panels are your choice. For commercial applications such as industrial garages, workshops and retail stores, the Heavy Duty slatwall panel and heavy duty slatwall hooks should be selected. The panel’s added thickness and its solid core, make it a lot more durable from knocks that will likely happen with heavy traffic. The challenge in a commercial environment is the likely frequency and weight of the knocks on the panels. Having a thicker finish will ensure they have little impact on the panel itself. Even if they do however, the colour is developed into the core of the panel, so they will not show. The added advantage of the Heavy Duty Slatwall panel is its taller profile. At 381mm each panel covers more space which in turn means less panels are required and less labour to install them. 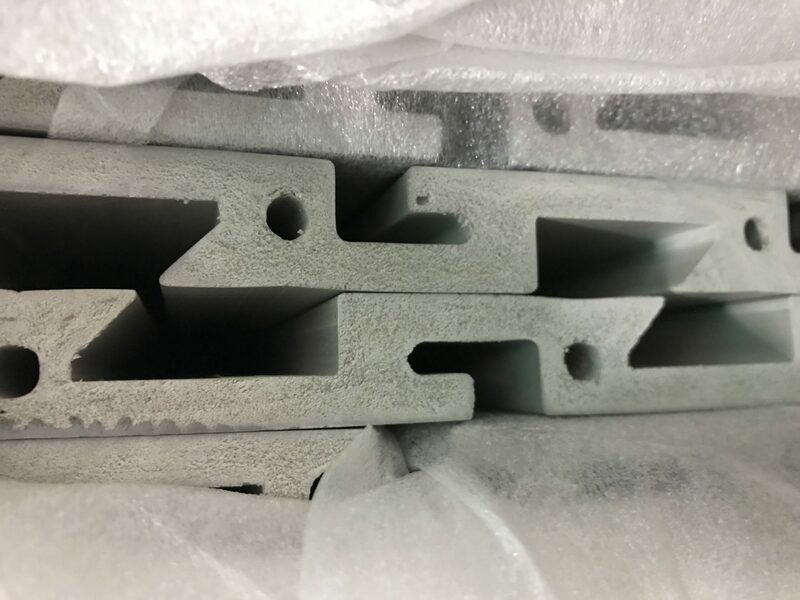 When you compare the thickness of these panels to both a wooden slatwall finish or even a metallic one, you can appreciate the difference in quality and added durability.